This week, we turn the spotlight around and point it toward the folks standing behind the action: the ones usually holding cameras and trying to not be seen. Over the last year, David Hollings and Hannah McCormick have emerged among the most passionate proponents of World of Warcraft esports. Their GCDTV productions are top notch, and their devotion to the community around them is inspiring. Q: Where did you get started with video games? A: When I was five years old, playing Sonic the Hedgehog. My brothers called me weird because I was more interested in exploring every nook and cranny of each level, instead of speeding through and finishing it. I play video games the same way today: slow and thorough. Q: Is “slow and thorough” how you play World of Warcraft? A: World of Warcraft defined my experience with video games and also changed my life in quite a few ways. Back when I was in middle school, socializing and making friends are something I struggled with. All I wanted to do was to submerge myself in my favorite video game. I was amazed when I discovered World of Warcraft, a huge game that allowed me to share my passions with others. My life forever changed for the better. I was able to make so many lifelong connections and friends and was even lucky enough to meet the love of my life in-game. Q: When in WoW did you meet? A: Hannah and I met in early Burning Crusade. Her brother was my Arena partner and once she reached max-level we started including her in our battleground groups and questing parties. We kind of gravitated to one another because we both preferred the same class and spec (Holy Paladin). We became close friends. Three years later, she decided to come all the way from Hawaii to visit me in Connecticut. We’ve been together ever since! Q: What’s your focus in-game? A: Esports has always been near and dear to my heart. My passion for video games was unique in my family, but my interest in competition is something all of my family members share. Growing up, I was really interested in competing in video game tournaments at the local gaming store. When I started playing World of Warcraft, my focus quickly became Arenas and Battlegrounds. Q: And where did that lead you? A: In 2014, an incredibly generous online friend of ours (Emmy) offered us tickets to BlizzCon and a place to stay. We couldn't pass up such a big opportunity and thank goodness we didn't because Emmy's act of kindness changed our lives. BlizzCon was amazing. We got immersed by passionate people, the professional players, the competition, the production crews, and the exciting nail-biting games. We met so many new and old friends for the first time and it was very hard to say goodbye to it all, so we decided we wouldn’t let it end. In early 2015 we organized a small tournament with players from our server. I live-streamed the event, and to our surprise, we reached over 1,000 concurrent viewers. With the success of our first tournament, we hosted another, and it peaked at over 2,500 viewers! We realized there was a community that shared the same passion as us and wanted more World of Warcraft tournaments. Q: A lot of people might stop there! How did you proceed from that initial success? A: We took it upon ourselves to start hosting weekly Arena tournaments. Hannah quickly became the head admin of GCDTV, communicating with players constantly and organizing every event, while I focused mostly on broadcasting. At first, it was a hobby, something we did in our spare time. But then each and every week, support for what we were doing grew, and some of the best players started competing, and our viewership was reaching peaks we never thought we could reach. More and more people subscribed to our Twitch channel and the possibility of making it into a job was becoming a reality. A: After twenty weekly Arena tournaments, I decided to take a risk and quit my job and start focusing all my energy on GCDTV. Hannah, the amazing person she is, completely understood and supported me all the way. That led to us getting the huge opportunity to help Blizzard host the online Qualifiers for the Road to BlizzCon. It was an amazing experience that led to our participation in the NA Regionals for World of Warcraft and Heroes of the Storm, and then the World Championships for both games at BlizzCon. The entire year felt surreal for us -- we went from being spectators to being a part of these amazing events. Since then, we hosted a Pro League season in North America and are now in the middle of a Pro League season for Europe. Q: How would you describe the future in one sentence? 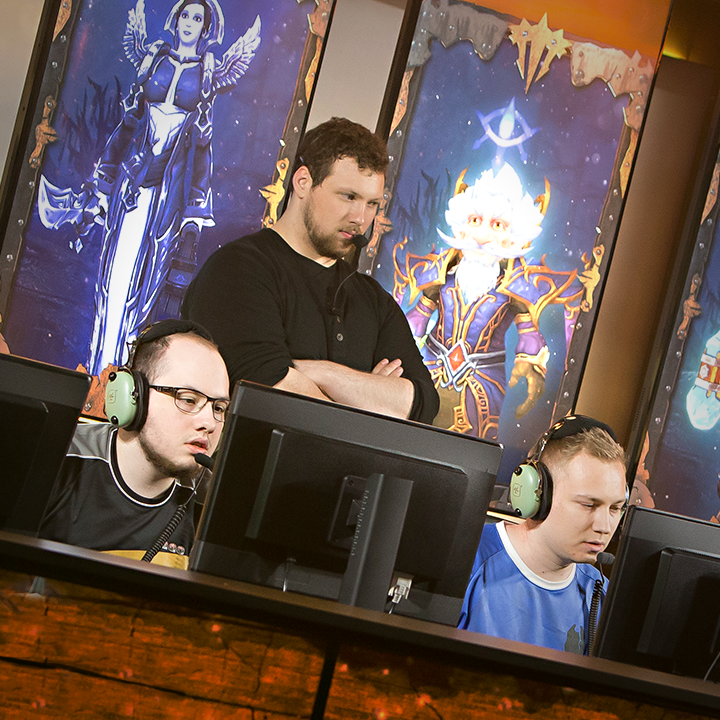 A: With Legion right around the corner, we are pumped and are extremely motivated to host many more tournaments! And most importantly, visit the GCDTV website and mark your calendars for their upcoming events!